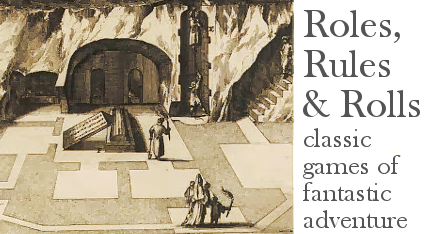 The original megadungeon, Greyhawk Castle, was devised for a rolling playgroup that met over many long evenings and weekends. Addicted to the thrill of a new style of gaming, that group could cover pages and pages of graph paper, forge characters in the heat of unforgiving death, and over years reach the highest levels and the lowest. Today's gamers rarely have time for such foolishness. Jobs, kids, life in general keep us to one session a week if we're lucky, though more often expect twice a month. Will your party explore the whole of whatever megadungeon you've created? Almost certainly not. But more important is the knowledge that they could go off in many different directions; that the whole living breathing potential sprawl of the place is there around them. 1. 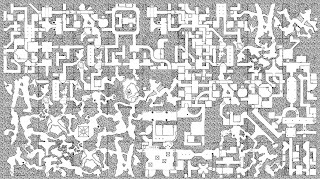 The sub-areas of the dungeon must show differences in design (wide passages, narrow passages, orthogonal, diagonal, curved, irregular, etc.) and decoration. 2. 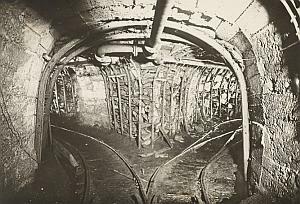 The areas of the dungeon should relate a meaningful history for the players to discover. This can happen on a micro level - "this was once the kitchen of the Minotaur Lord but now it is the lab of a crazed alchemist" - and a macro level - evidence related to what the Minotaur Lord was doing, how he got on with the other power groups, what his place was in the rationale of the dungeon. 3. 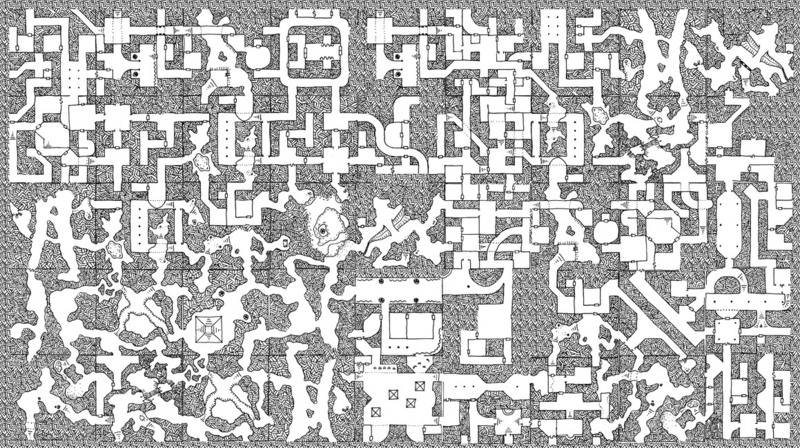 The areas of the dungeon should refer to each other, both in terms of architecture (a multiplicity of stairs, chutes, teleporters giving the sense of freedom of movement between safer and more dangerous places) and features ("this lever opens the portcullis on level 3"..."in this room is an ambassador from the troglodytes on level 4"). Now, life is short not just for players but GMs as well. The temptation is to make it up as one goes along, but this risks missing out on the epic sweep and overarching plan implied in criteria 2 and 3. Recently, JDJarvis over at Aeons and Auguries has suggested a modular, crowdsourced approach, in which people contribute individual sections but the exact geographical connection between them is up to the individual GM. I like this, because it takes a lot of the burden of effort from the individual GM while still allowing creative input and personalization. But question number 2 and 3 remain - how to convey an overarching theme and plot? Next post I'll address this issue, explain why I can't stand geomorphs, and offer a better solution. I don't know why people complain about there being no monsters in Lamentations of the Flame Princess. Or maybe just excessive caution? Who knows. But I'm not here to have any more arguments about this. No more unmannerly comments, please. 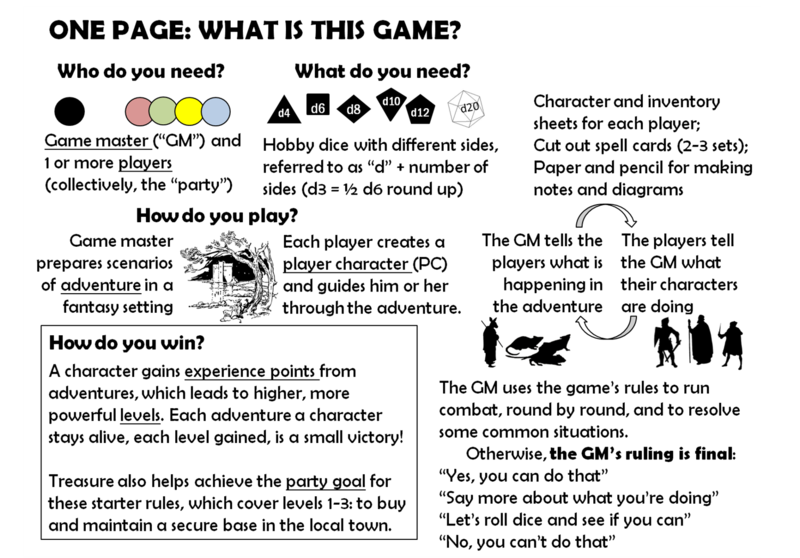 And now please welcome the first installment of the "One Page" fantasy gaming system. The quality of this product is such that it embodies every design decision that is objectively correct. You may think you preferred descending AC or the standard spell lists, but once you see this work shine forth with piercing beams of correctness, your worldview will certainly be dislodged, and you will acknowledge the One True Way. After lo, these many years, and countless futile and abortive attempts, That Darn Roleplaying Game is finally fixed! Put down your house rules, ball up your supplements. The capstone has been lowered on an era. Ah, who am I fooling? I'll be happy if you steal a few ideas from here for your own game. That's why every rule is on its own page, and this will be clearer once the somewhat interlinked stuff surrounding character creation gives way to the systems of play. Just before the Open Game License (AIEEE!) there is a brief and functionally formatted guide to what is to come. Damn Blogger for not being a forum. Rather than bury my replies to yesterday's comments, I'll make them into a post. If you were legal under copyright law, but they send you a C&D anyways then they could do the same under the OGL. You're just operating under contract law now instead of copyright law. I'll take my chances with a tightly worded contract that they've provided an FAQ for, rather than the poorly understood murk of copyright law, especially across national boundaries (I'm a US citizen living in the UK), especially in the realm of games where very little precedent has been worked out. What words or concepts did you use that you feel put you at risk? It's not any one or two or three, it's a complete game product that pretty much uses all of them, and that's all I was going to put under OGL. I'm not talking about trademark law here, of course, I'm talking about what would count as a "derivative work" (standard copyright law) rather than a "novel extension" (the Super Add-Ons precedent). Indeed, you do sign away your right to nominative use with the OGL. I can live with that; people are familiar with the coy work-arounds by now. But I'm not sure any statement can make a retro-clone or complete houseruled game into "fair use" (see here). 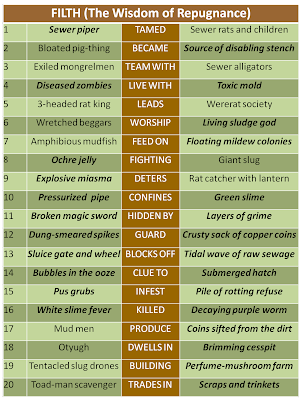 At issue is whether the use of all the game terms from D&D together constitutes a particular expression of an idea even if the exact words to describe them are different. ...either you create something completely original without a trace of SRD to it or you will be in violation of the OGL. So you are saying that using the OGL for one work binds you to use it for all? Seems to me that if you don't accept the contract you take your chances with copyright law and the fair use doctrine. Based on precedent my impression is that an "add-on" that uses the terms from the game would fall under fair use but a derivative work that attempts to do exactly what the SRD is doing would not. Of course, if you do include the license then you have to make sure your use of the SRD is kosher. This is the crucial issue for us all I think - to what extent the terms in the SRD are covered by copyright, as opposed to their precise expression as game system. If you rework the stats to give different effects, be generated differently (or at all - the SRD does not cover character creation, a gap that was put in there to cripple it as a complete RPG), but you use five out of the six names, would that be fair use or a derivative work? The Wizards FAQ refers to a stat block as one of the elements of the SRD: is it the concept of a stat block (I doubt it, too much prior art), a stat block with some of the terms but working completely differently, or a stat block with all the exact terms as laid out in the SRD? Example: Game mechanics can't be copyrighted, but under the OGL you control it's fate. You have opted out of the standard copyright and secured the material inside a contract. If you put those mechanics under Product Identity. And you have only secured them to the extent that other people use that contract. Under the OGL you can lock it down under Product Identity and if someone uses the material then they can be sued due to license violation. Even if they never signed up to the OGL? I don't think that solves the problem. The flurry of questions about my decision to put the One Page system under the Open Game License spurred me to do even more reading and research on this topic. One of the most useful resources I ran into, among a lot of ill-informed posturing, was this post and its predecessors, from someone who knows what he is talking about and has a good discrimination among sources. Short terms or phrases don't fall under copyright unless they are emblematic of the work in question (like "Play it again, Sam" for Casablanca). Precedent supports the making of original "add-ons" and supplements for games without license. References to trademarks are allowed under the doctrine of nominative use, provided there is no other commonly recognized way to refer to the trademarked thing, and there is no confusion as to the origin of the product. Game mechanics may be subject to patent (as in Wizards' soon-to-expire patent on the concept of a collectible card game) but this is a separate issue. Nonetheless, a legal injunction can really test the mettle of the small company or individual it's leveled at. Which makes the Open Gaming License so amazing. Ryan Dancey and Wizards gave any creator of works derivative of the D&D game an invulnerability potion versus legal menaces. The promise is that, as long as the strictures of the document are followed, even the most blatant retro-clones are freely licensed product. There is even a way to combine open and proprietary material with the "Product Identity" clauses. Not great from the viewpoints of open source crusaders, but good from a commercial viewpoint. Well, it seemed like a good idea at the time, but every general is fighting the last war. The OGL was a silver bullet for two problems that had helped drag down TSR in the 1990's: commitment to producing a glut of official products, and bad publicity from infringement policing. In that light it was a brilliant single stroke combining PR and outsourcing. But over ten years later, as the sales of the OGL product Pathfinder have outstripped those of the official D&D game, there must be bitter regrets indeed in Providence. Certainly, strong signals are being sent that the next Hasbro edition of D&D is going to go back to basics. If that's the case, it's likely that material being sold or given away that is currently not compatible with D&D 4th, but that sticks to the basic elements of D&D that have been very carefully maintained over otherwise seismic changes in the gameplay, will constitute more of a threat to their operations. In particular this would be true of complete games - "heartbreakers" - that let the players dispense with the core product that forms the mainstay of sales. It's also instructive that without exception, every commercial role-playing game that has been released as a clone or derivative of D&D, using that common language of stats and mechanics, has put itself under the OGL. This has decidedly not been the case with supplements. 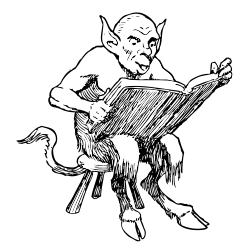 Now, some people in the OSR (chiefly flagship captain Maliszewski) are extremely careful with their online content, to the point of putting every monster and spell idea under the OGL. My gamble is that this won't be strictly necessary. 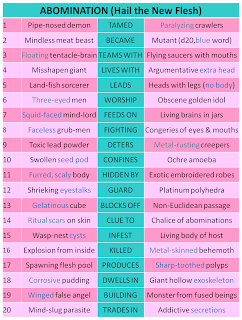 But something tells me that putting the core derivative work on this site - the One Page Rules modular D&D variant I have been using in games - under OGL rather than Creative Commons is a very good idea. There is enough of D&D's DNA in there that it seems both the prudent and correct thing to do. That is my position anyway - certainly not legal advice of any qualified kind. If you think differently, won't you speak up in the comments? Definitely not part of the normal encounter table series. But hey ... Merry Christmas! ... and you're on his list. 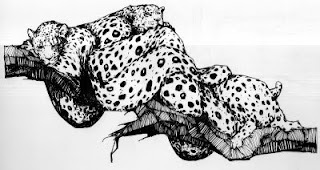 All punk rock nostalgia aside, there is a preview of the Secret Santicore project up and it is amazing - my request has been answered in spades by one of the best creators out there and will probably be a feature of my campaigns in 2012. Jez even included my castle map in the preview, though I wish I'd made the descriptions a little more fancy, but still, the presentation is outstanding. Also, full table of contents. If Bosch, Cronenberg, Burroughs and Lovecraft collaborated on a theme park, it might look something like this. One third of the way through! 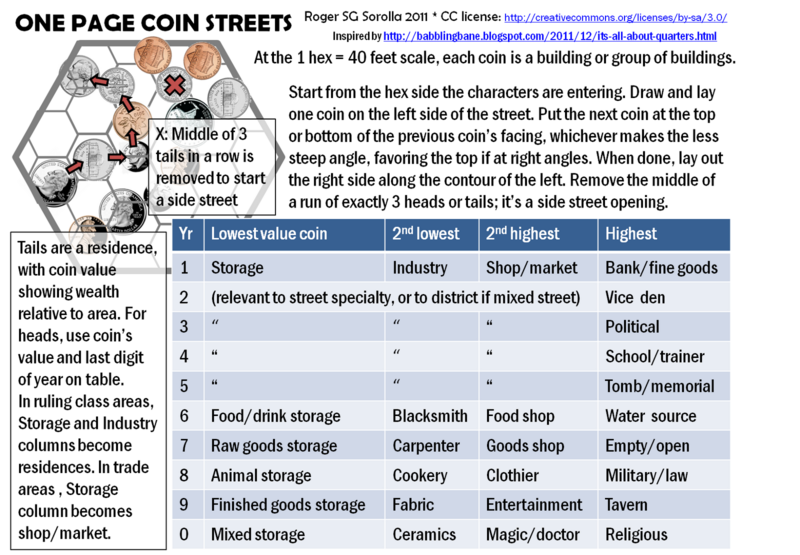 Going on an even deeper level than the previous two installments, once you know the general character of a street area, you can use coins to create a scene for encounters or exploration. 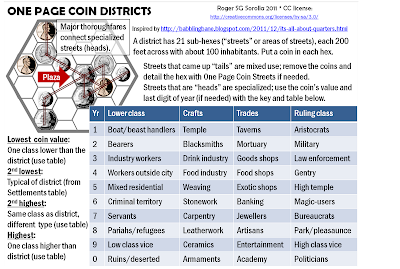 The random facing of the coins thrown down create a twisty little street that may branch and fork, as the characters enter from the larger thoroughfare. Now how great a relic would that be? A pity these historical spoilsport Scooby Doo mask-rippers have revealed it was just a lumpy lemon stolen from a synagogue in the times of King Henry III. But we can do better. The Branches of Modesty, lost forever, alas. This fruit is not actually an apple, nor fig, pomegranate, citron or any other known fruit. It is a green sphere with golden streaks about the size of a large grapefruit, perfectly preserved since time immemorial. The two bites in it, one on each side, reveal a pearlescent white flesh that shimmers with the promise of the knowledge of good and evil. Any who take a blasphemous third bite of the apple will surpass their ancestral parents' moral insight. 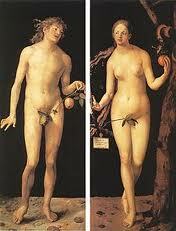 Beyond knowledge of their own good and evil nature, they now are granted the ability to see good and evil in others. They can concentrate to get an idea of the good or evil motives of another person within 10' of them. 1. Roll the character's Wisdom each time. If failed, the character sees only potential for good and evil, not actual good or evil motives, without knowing it. This can lead to false accusations or unfounded trust. 2. Each time the power is used, a stalking angel with a flaming sword gets 500 feet closer to the character. When the angel makes contact, he banishes the character from this world, into a world of even lower promise. 3. The power also heightens the character's sense of his or her own sinfulness. Each blameworthy act he or she commits will force a save vs. spell (Will) or be driven to suicide. 5. Save or die each time the power is used. 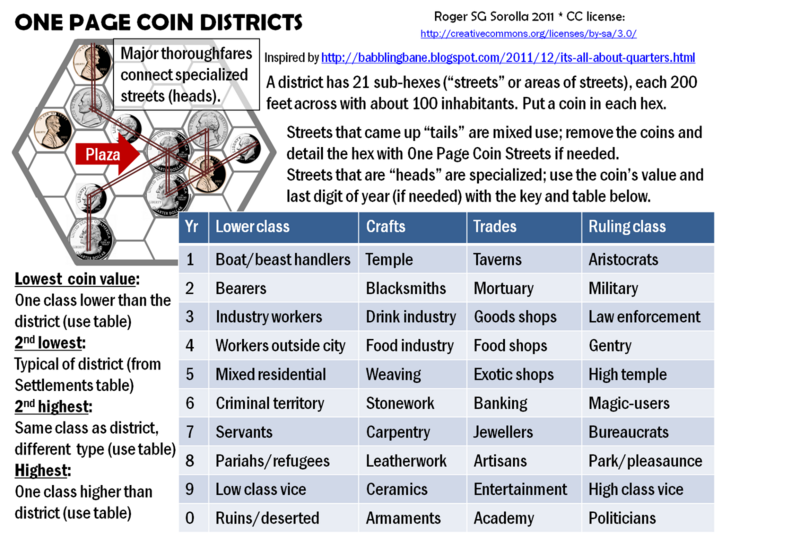 The next step down from the district, in our coin-based city system, is the "street" - well, really, a 200 foot wide area that may contain one notable street and a number of side passages and alleys. The world of narrow streets is traversed by wider thoroughfares that connect the districts. 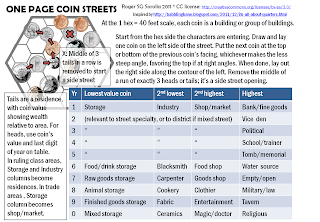 One Page Streets lets you generate all of this with a handful of change (and you don't have to have 21 coins ... just recycle the ones that turn tails up). This system also works for creating a full-sized town of 2000, or of fewer people with fewer hexes, as long as you use the district system to give it an overall character and main industry. 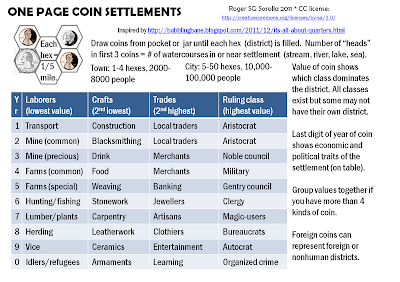 The Babbling Bane took Talysman's system of city "quarters" literally and used a handful of random coins to improvise a village layout. 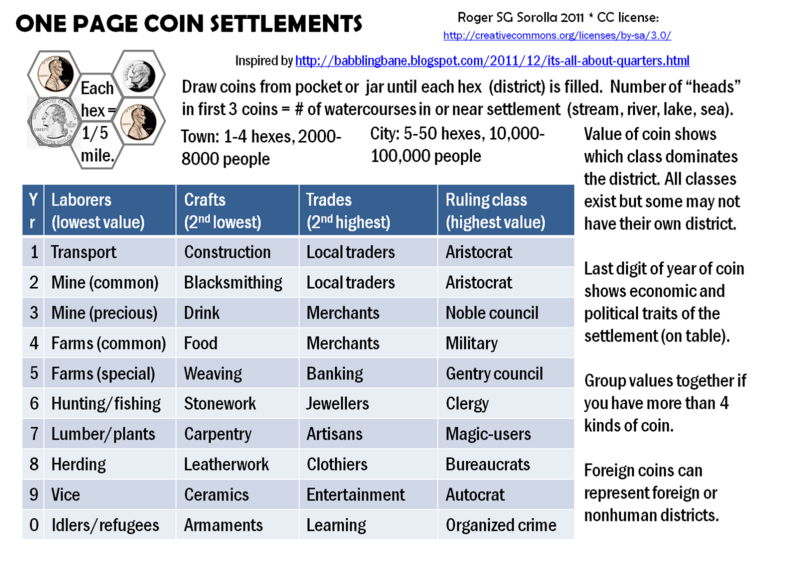 Bearing in mind the international audience, I've made the coin specification as generic as possible. If you are in the euro-zone (touch wood) with 8 different denominations of coins, for example, you could put 1 cent and 5 cent in the lowest class, 10 and 20 in the next lowest, then 50 cent, then 1/2EUR. 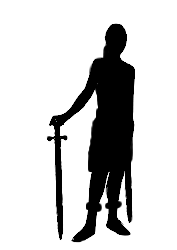 I thought I'd give back to the community in the spirit of the commendable Telecanter with these two silhouettes - a two-handed axe man I ginned up for my One Page rules, and a female fighter-type I thought filled a gap in the available selection. These are from public domain art and free for use under a Creative Commons license (http://creativecommons.org/licenses/by-sa/3.0/). Incidentally, the reason it's taking me so long to get the One Page starter pdf up is that I'm taking some good advice and switching it to OGL - it uses way too many terms from the SRD to risk any other way. And of course, that means retroactively re-licensing everything SRD-derivative I put up on this blog, but I think I have a form of words that will allow me to do that. And presto ... he's a frost giant! Okay kiddies, tonight the Count has got something really scaaaary for you. Boo! Ahahahahah. Ladies and gentlemen ... Green slime has a theme song. In this technicolor B-movie from 1968, there's apparent inspiration for not one, not two, but three old-school gaming classics. Of course, the green slime. 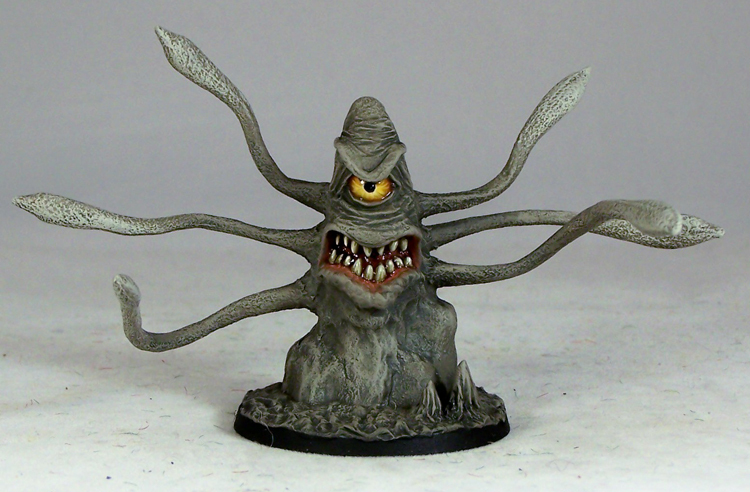 But then, the slime creatures ... with their one eye and tentacles ... kind of resemble Ropers. 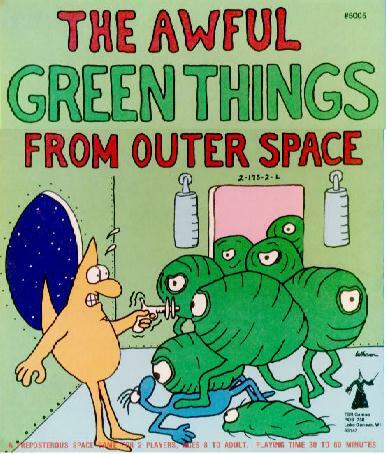 And finally, the plot of the film ... one-eyed green aliens grow from larval form in a station, are blasted with energy weapons which only make them grow and multiply, and eventually overrun the whole place ... is a very likely inspiration for the classic Tom Wham game from TSR (and later Steve Jackson), The Awful Green Things From Outer Space. And the director? The underappreciated Kinji Fukusaku, better known for Battles Without Honor or Humanity, Tora! Tora! Tora! and Battle Royale. So this weekend I kicked off a new campaign using Matt Finch's Tomb of the Iron God as the starting adventure. Last year it was recommended to me and it definitely delivered on the old school funhouse-plus-meaningful exploration front. My players are fellow psychology students and researchers, seasoned online gamers all. Because of the tactical mindset, one issue came up during play that I'd like some feedback on. My wife played a rogue character, as she'd been wanting to do ever since the RPG bug hit our household. But in practice, a rogue/thief/whatever under the Basic D&D or OD&D dispensation is very limited as a dungeon scout explorer. 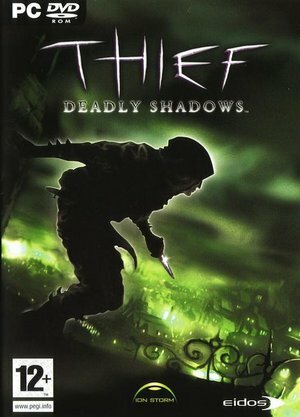 With race-as-class, a human thief can have no infravision, and sneaking around a dungeon with a shiny light is not very practical. Of course, in race-plus-class systems like AD&D this is one big reason to take a nonhuman thief (plus all the racial skill bonuses) and in thiefless systems like true OD&D it's a non-issue. So, have any players or DMs come up with creative solutions to let the thief-type take point in a dark, dark dungeon? 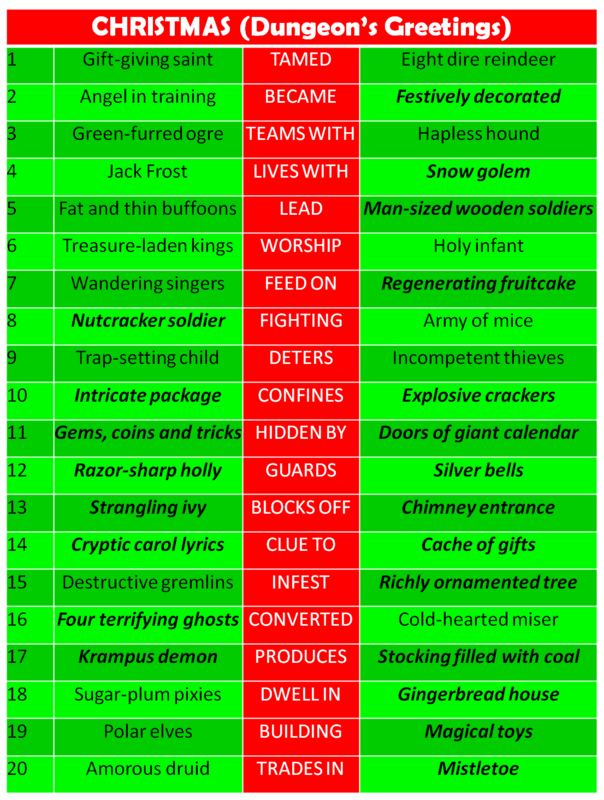 Not only did the hex-and-counter game suffer a sharp decline in the 1980's, but the medium was not that well suited to depicting a fantasy epic. There's a limit to how much information a counter or map hex can hold, and most of these games creaked under the weight of a mass of special rules that had to be constantly looked up. There is also a kind of first-kiss syndrome that paints a halo around these old games. I think a lot of the positive feelings old-schoolers associate with them are residue from anticipating how cool it might be to try them, as well as a much less critical outlook when actually played. Not by coincidence, gaming companies in the 70's and 80's also seemingly chose to produce games largely on how cool they sounded. They had a naive (by today's standards) outlook on usability, play balance, elegance, replay value, and other factors that have come to gamers' awareness in the Internet decades. Again and again in comments on BGG - and in some comments on previous posts here - we hear that the rules are incomplete and baffling, the gameplay either simplistic and obvious or swingy and random. As obscure as the counter-based epic fantasy games from the 70's are today, the ones I presented previously are actually the better-known of the lot. The list below from 1980 on is largely a product of Boardgamegeek (BGG) research; I only have definite memories of seeing Barbarian Kings, Valley of the Four Winds, and of course the late arrival Greyhawk Wars. 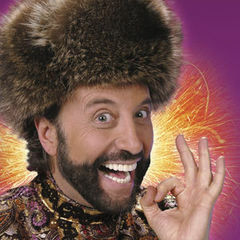 All right folks. 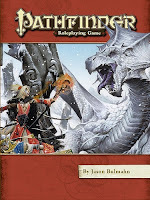 After a lot of jogging of the memory and a little trawling through Boardgamegeek, here is the first part of what I believe to be a complete catalogue of the epic fantasy counter-based board wargame genre, as defined in my previous post. In the 1970's and early 1980's, the established hobby of board wargaming cross-fertilized with a wave of interest in fantasy literature and adventure. The result? A genre of game largely neglected in the ongoing old-school revival: the epic fantasy wargame. Below I'll catalogue the central elements of this genre; the ones in bold I think are essential, the other just typical. Epic-scale map board. The map takes in kingdoms and even continents, on a grand-strategic scale. It depicts either an invented fantasy world; a fantasy world taken from fiction; or potentially, a real-world area given a fantasy treatment. Hexagonal map grid. Although this was typical of games in that era, there were some games (like the Elric one, or Greyhawk Wars) that dispensed with this, using movement by areas instead. Arguably, you don't really need the kind of precise rendering of maneuvers and battlelines that hexagons give when gaming large-scale pre-conscription warfare, in which small armies cruised across a huge landscape without much operational subtlety, and clashed at designated battlefields. Die-cut cardboard counters. Another standard feature defining the era's wargames. The success of Axis and Allies in the early 90's would create another related genre of game using plastic figures, but that belongs to a later time. The counters represent armies as well as individuals ... Without the armies, it's not a wargame, but an adventure or quest game (as in Greg Stafford's King Arthur's Knights). Without the individuals, it's not epic - typically, one of these games would have rules for heroes leading armies, as well as going on quests, conducting diplomacy, and other things that armies can't accomplish. .. and there is a lot of flavor and color through other means. 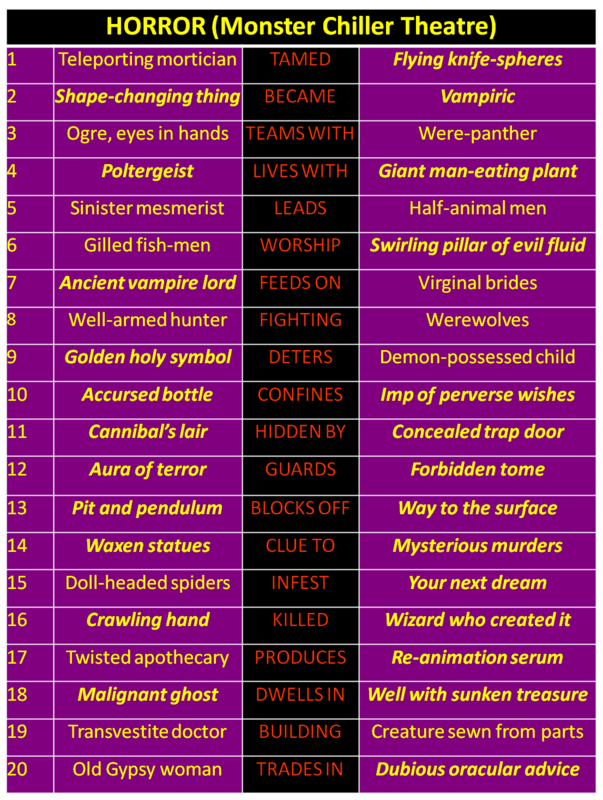 Counters for monsters, artifacts, special locations; cards, tables, or numbered paragraphs representing events, nations to be won though diplomacy, relics ... all of these are very typical of the genre and helped give each game the special flavor of its world. With all these elements, the play and objectives of one of these games were fairly similar to the historical equivalents. 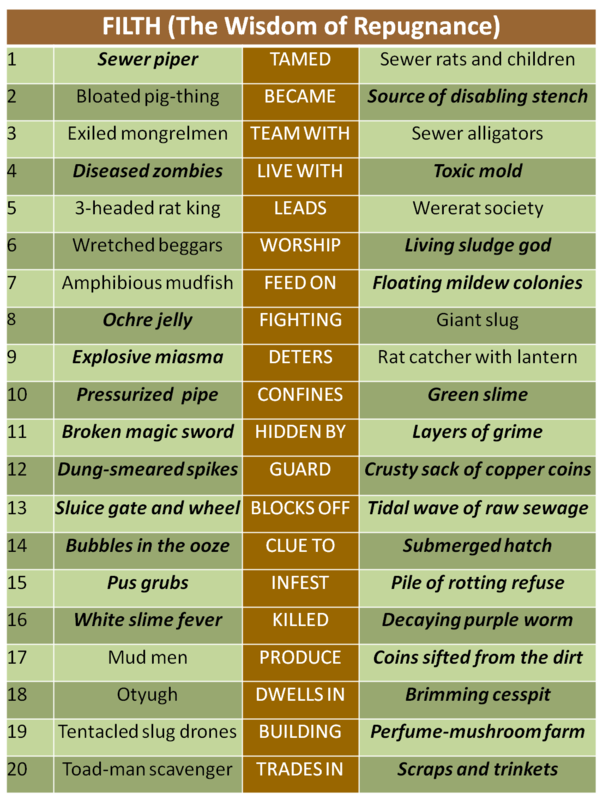 Armies fought by comparing strengths and a die roll on a chart, and the object of the game was to capture territory; or at least doing so won victory points. 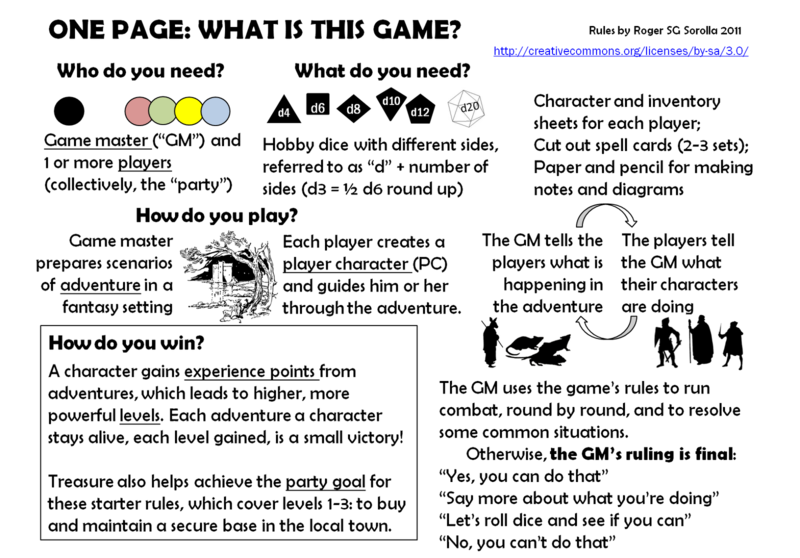 Less typical, though, was the "epic" layer in which heroes moved around the board attempting various things, gaining magic items and allies, which in turn could serve as an alternate victory condition or contribute to victory points. In the next post I'll attempt a catalogue of these games, and ask for your help in identifying any I may have missed. Every city ... every hell ... every universe ... needs a sewer. Let the fastidious beware! Part 10 in a series. Evolutionary psychology meets the Monster Manual in a new book by Paul A. Trout, "Deadly Powers." According to the author's summary in an article for Salon, we can explain the most awesome and nearly universally imagined monster around, the dragon, as a confluence of biologically prepared fears of the three main hunters of our tree-dwelling primate ancestors: snakes, raptor birds, and feline predators. These have armed the dragon and kindred monsters - griffons, couatls, and kamadans (OK, not really kamadans) - with their wings, scales, and fangs. Zak S's Kamadan could scare the pants off a loris. I haven't read the book, but the author's comments led me to think some more about the evolutionary approach to psychology. I'm no stranger to this topic and I've found it useful in my own writings to think about how emotions serve useful functions for individuals and social groups.But there's a difference between my functional perspective, and the claim that a phenomenon is biologically prepared and inherited from a distant past. I make no claims about this genetic route of behavioral transmission because I don't study genes. 1. Which ancestral environment are we talking about? The bird-snake-cat theory traces us back to small tree-dwelling creatures. Others refer to our time on the ancestral savannah. There may have been an aquatic period in there. 2. There is always an escape clause if we don't find that a behavior has survived from those times: it must have disappeared because it was no longer adaptive. In actual fact, what happens is psychologists find a phenomenon that exists in modern humans, and then try to explain it in terms of what might have been adaptive in one of those environments, or a similar behavior in an animal species. With this kind of hindsight bias, there are all kind of ways to stumble across a phenomenon that has a closer, better explanation in terms of cultural adaptation. So take the prevalence of mythological monsters, with their snake-bird-cat aspect. The more straightforward answer is that lions, tigers and ocelots roamed over most of the planet's surface two thousand years ago, and they were scary. Birds and snakes possess magic and strange means of movement, so they naturally tend to have cultic significance even if they're not imagined as huge, and there are enough crocodiles in our African past to explain dragons more prosaically. Why propose special genetic baggage held over from tree-shrews, when cultural concerns are more flexible, also adapt to survival concerns, and explain differences as well as similarities in the world's myths? A better candidate for a genetic adaptation is the way a few very specific small animals attract phobias - irrational mixtures of fear and disgust that serve as a footnote to the generally useful rule, "if it's bigger than you, run away." The most common targets of animal phobias are snakes and spiders, a tendency that occurs universally, and has obvious survival value in avoiding poison bites. 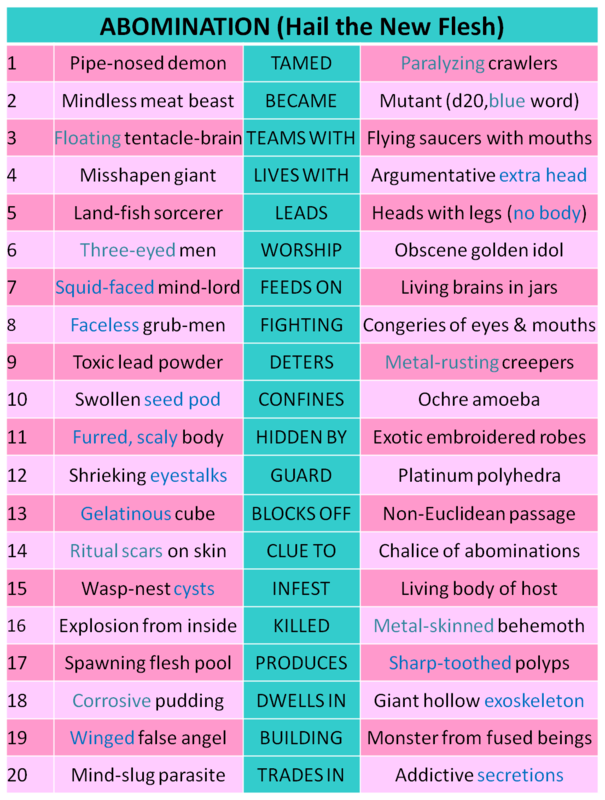 The fear-disgust mix also translates to "weird" or "horrifying" and explains why snakes and spiders, rather than birds or cats, are the mainstays (together with dead things and tentacles) of the weird fantasy genre. While the griffon can get a makeover as the most noble beast, there's always going to be something sinister about the giant flying snake. Another Mad Archmage Saturday at the gaming society, augmented by three potential players for a new campaign, including my wife (why does she always roll up magic-users?) I wanted them to get used to the system and my GMing ways before committing to something lengthier. With the mixture of new and returning players the pressure to streamline character generation was greater than before. Say what you will about pre-THACO systems where the GM controls the attack and saving matrices, running that way means that character generation is lightning fast, with only abilities, classes, spells and equipment to determine. I skipped the saving throw step in character generation, and indeed, none of the new characters needed to make a save. I think in future, I'll skip the determination of most of the secondary bonuses and stats until they're actually called for, bring character generation closer to 15 than 30 minutes. What Is This Thing That Is Not A Role-Playing Game? And with the first page of the One Page series I bring the first book, covering character creation, to a close. This is my simplest and most honest answer to the question in the page's title. People who already know what an RPG is - I mean really, is there anyone under 35 who hasn't grown up playing computer games? - will recognize the idea, but be enlightened by the face-to-face manner of execution. You will note that "role-playing," "story-telling," "personas" and the like are left behind with the excess baggage. And heretically, I address the question of winning. For this game eventually will come with training wheels, a model starter Generick Fantasye dungeon, village and town which the uncreative GM will learn from, and the creative GM will need no instruction to supersede. 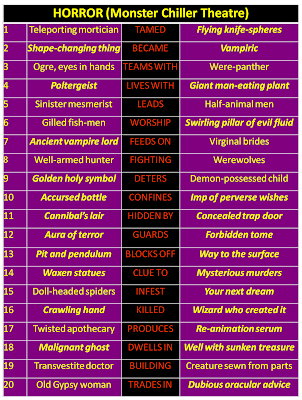 The list of options in the lower right owes some debt to a number of posts over the past half year or so, in the Hack and Slash blog. 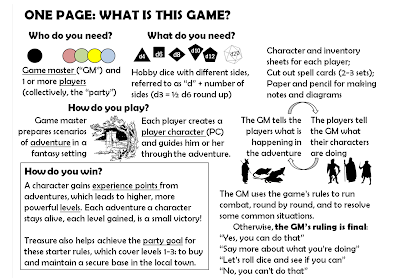 So ... any interest in a pdf of the intro and the whole character creation set so far? Comment if you want an explanation!